We all went in the View today. We stopped in Tecopa at the elementary school where there was a water tank. The pressure was so low it was hopeless trying to fill our tank, so we went on to China Ranch. There is steep canyon with sharp turns to get into the ranch. We made it through the canyon and I filled the tank with their hose. We had date milkshakes which were very good and toured the 25 acre date palm farm. We climbed back out of the China Ranch and went to Shoshone. 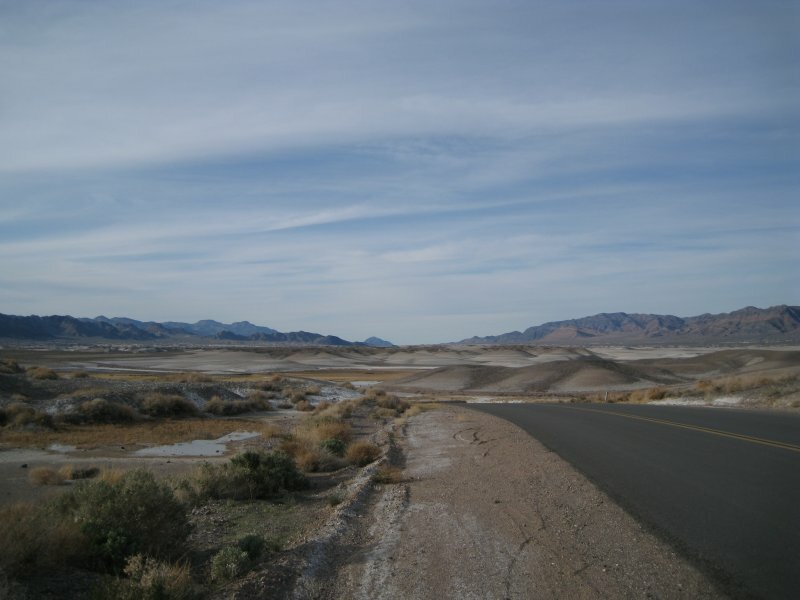 Originally the town was built to serve the Tonopah and Tidewater railway line in 1908. Now it is one of the gateways to Death Valley. We had lunch at the Famous Crowbar CafÃ© & Saloon. We joined the motorcycle crowd and had a pretty good lunch there. Next door is the Shoshone Museum which had WiFi and I managed to get a couple of emails off. The service was too slow for access to the blog. After lunch we toured the caves built by talc miners in the area and headed back to the campsite. I was intrigued by the dunes in the area and hiked a mile along the road to see them (see photo). They are fragile mud hills according to a sign along the highway. Tonight we will take to the mineral water hot springs again. The water here is rated highly by spa lovers worldwide. The very high sodium content makes the water very smooth and it has no odor.